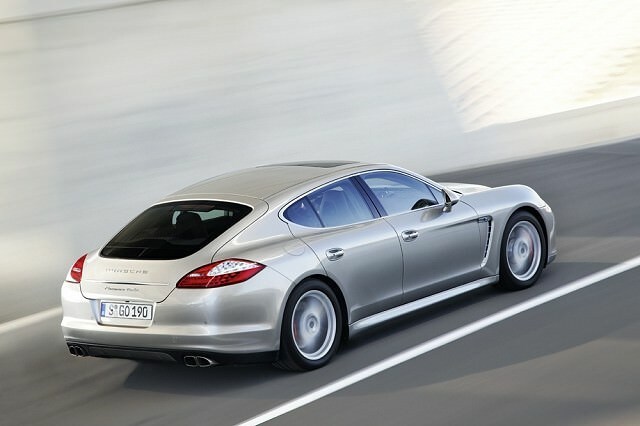 Porsche might primarily be considered a sports car company, but the introduction of the Panamera in 2009 added a saloon (it's technically a hatchback) to its product line-up. Porsche might primarily be considered a sports car company, but the introduction of the Panamera in 2009 added a saloon (it's technically a hatchback) to its product line-up. In typical Porsche fashion its styling follows that of the company’s iconic 911 model, and the result rather polarises opinion - the Panamera is certainly not a conventional looker. Regardless of whether you love or hate the styling it’s impossible to deny its ability; the Panamera, in any form, is a formidable sports saloon. Exclusive and expensive, it’s a leftfield choice in the luxury car market, but if you want to drive rather than be driven it’s arguably the best. The Panamera range is extensive and varied, encompassing everything from two turbocharged models, the Turbo and Turbo S, to naturally aspirated V8s, a V6 petrol and V6 diesel and even a hybrid, the latter of which, from 2013, offers plug-in capability. The ‘S’ V8 models are offered in rear- or four-wheel drive (denoted by a '4' on their boot lid), while the Turbo and GTS models are only offered with all four wheels driven. That Turbo variant - and the even rarer and faster Turbo S - are incredibly rapid cars, able to cruise at over 300km/h on the Autobahn all day long, thanks to a 4.8-litre twin-turbocharged V8 engine developing as much as 550hp in the Turbo S.
The Panamera S and 4S 'make do' with just 400hp from the same base 4.8-litre V8 engine (without turbocharging), while the GTS adds a touch more power and focus in the unlikely event your commute takes in a track. The hybrid model is clever, if hugely expensive, which makes the two V6 offerings the only realistic choices unless your pockets are deeper than the mid-Atlantic trench. Both the V6 petrol and V6 turbodiesel are rear-wheel drive, the V6 petrol delivering 300hp and the turbodiesel 250hp. Equipment in all is high, featuring leather upholstery and climate control as standard. The V6 petrol cars come with six-speed manual transmissions, though the majority are specified with the seven-speed automatic. The V6 turbodiesel comes as standard with an eight-speed automatic. All the above applies to pre-2013 cars, when the range was overhauled with a mild styling makeover. At the same time the V8 engines of the S and 4S were replaced by turbocharged V6s offering greater performance and, crucially, improved economy. Regardless of its vintage the Panamera is predominantly a sports saloon rather than a luxury car rival, as rear seat accommodation is tight compared to cars like Mercedes-Benz’s S-Class, an Audi A8 or BMW 7 Series, while the boot isn’t particularly generous, either. You might find the occasional S, 4S or Turbo in the Carzone classifieds, but if you’re after choice then the 3.0 V6 turbodiesel is the one to go for. It’s a good pick too, as while it might not have headline grabbing performance, it does blend the Panamera’s fine driving dynamics with sensible economy and emissions - relatively speaking, here, it is still a Porsche. The Panamera is a remarkable car, sharing some of the magic of Porsche’s sports car range but in a more accommodating package. Only slightly though, as Porsche’s own Cayenne SUV arguably does a better job of carrying people. But if you cannot quite bring yourself to having a four-door Porsche that’s also an SUV then the Panamera does the job. Think of it as a BMW M5, Maserati Quattroporte and AMG Mercedes rival rather than a true luxury saloon; the Panamera might fill a small niche in the Irish marketplace, but it does so convincingly.